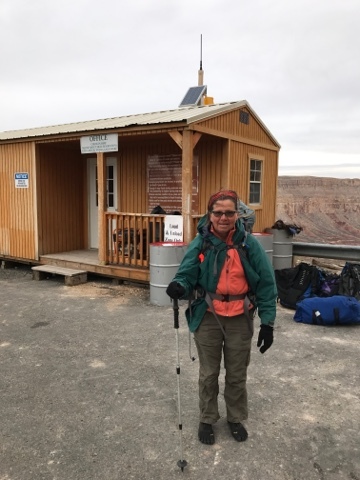 Sleeping at the trailhead on the rim of the canyon Saturday night was difficult between very strong winds that rocked the Prius and not being able to sleep well for what I believe I was just so anxious about the hike. In the morning the wind continued and it was in the 40's so it felt cold. Joanne and I arrived separately Saturday, with me getting here first. Overnight there were 2 person pop up tents all around the area (not shown above) with young people sleeping in them as part of a group hike. Saturday afternoon I fiddled with my backpack acquiescing about what I was carrying and what possibly I could leave behind to save weight. I made the decision to use my tent and not the bevy sac I bought at REI but didn't take the tags off. Sunday morning I was still doing the same. Joanne and I went over our checklists. 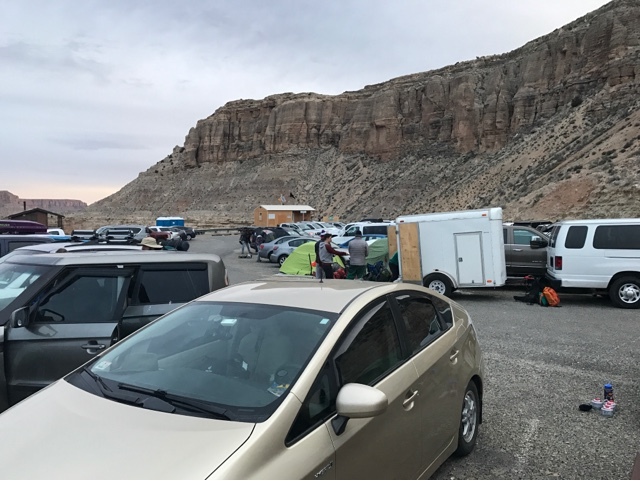 We added making sure everything was turned off on our vehicles as I met someone who hiked out that had killed their truck battery as they left a light on. It 75 miles to any civilization! The building behind me is where you check in if you had scheduled to have your camping equipment carried in with mules. We didn't want to do this unless one of us was injured. We wanted the satisfaction that we did it under our own power. Joanne chose to use a bivy sac to sleep in and she carried the stove and snacks and I carried 4 days of dried food for two people. We were taking a 3 day 2 night hike. More on food in a separate post. Our hike before us. 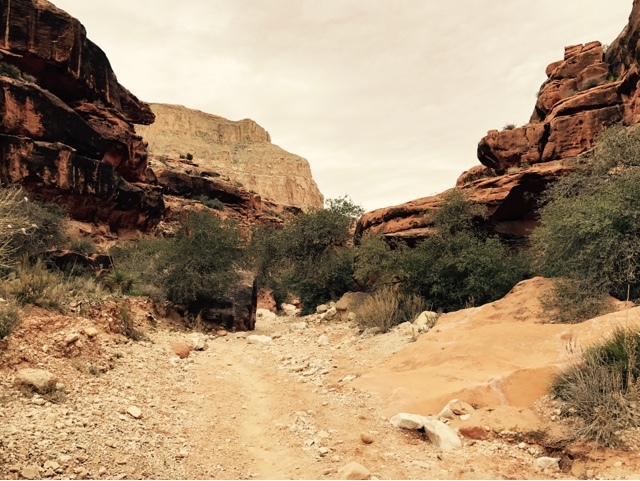 The first section are switchbacks that are generously wide as horses and mules use the trail too. 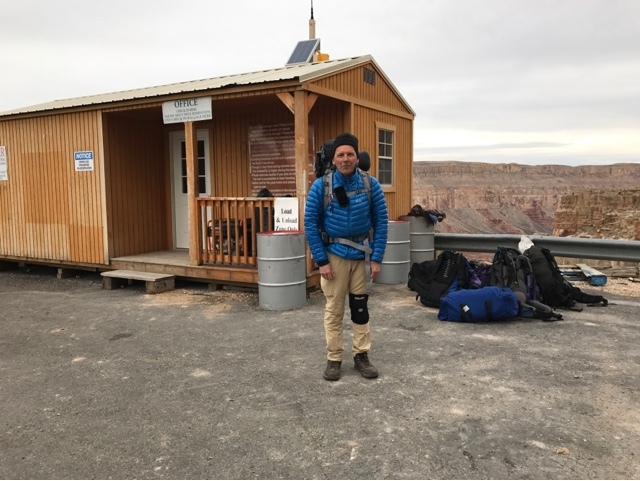 This is how supplies and mail is delivered to the Supai Village US Post Office. 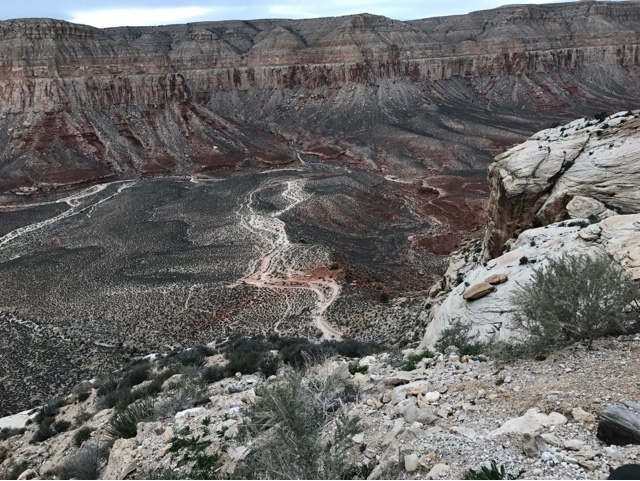 Although the trail is in the edge of the cliff the trail was not scary. Off in the center distance is the trail below. This is about a 1000 ft drop in about 2 miles. Not bad to go down but a different story coming up. That will be in a different post. 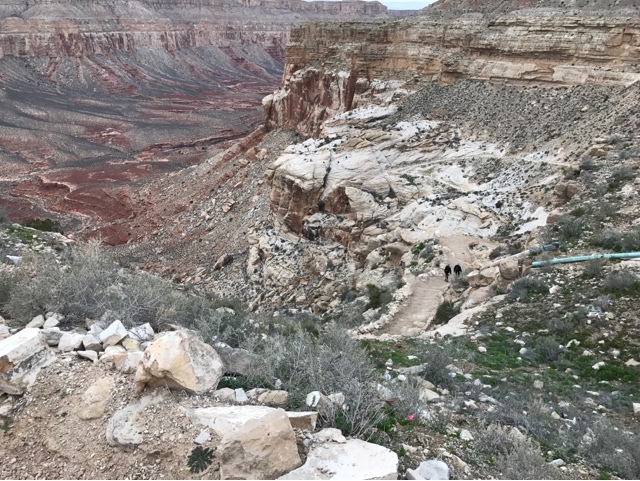 A little lower on the trail you can see down the Havasu Canyon that we will be hiking. Way down this canyon is the intersection of the the Havasu Creek that will flow through the Supai Village and form the various falls on the river we are going to see. 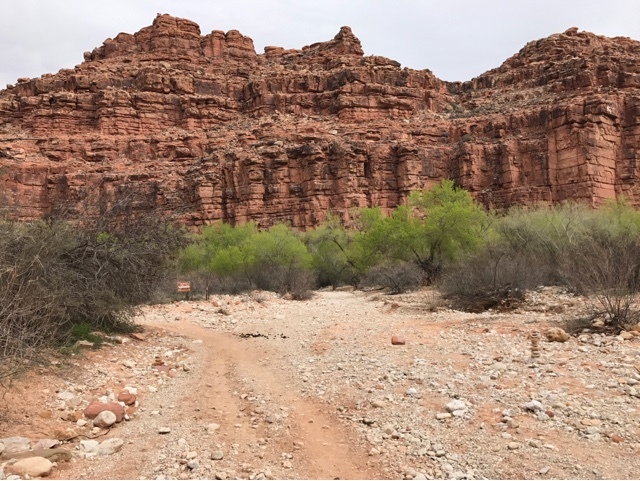 It is 6 miles from the top to where we meet Havasu Creek. 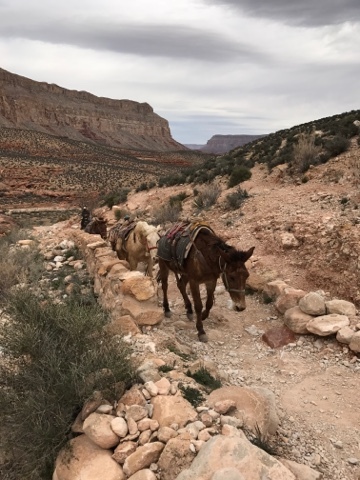 There are many pack mules and horses to carry things up and out of the canyon, including the one horse that carried the US Mail. There is one cowboy from the Reservation for each pack train. They take up the rear and pack animals up front. Some mules and horses go up empty and come down full with supplies for the stores in the village. Lower in the canyon you follow a trail that follows the wash and may cross the wash using the banking. The canyon sides rise well above you as you descend. Depending on where you are, you are in and out of the sun once the canyon narrows. The first 3 miles you are in the sun. 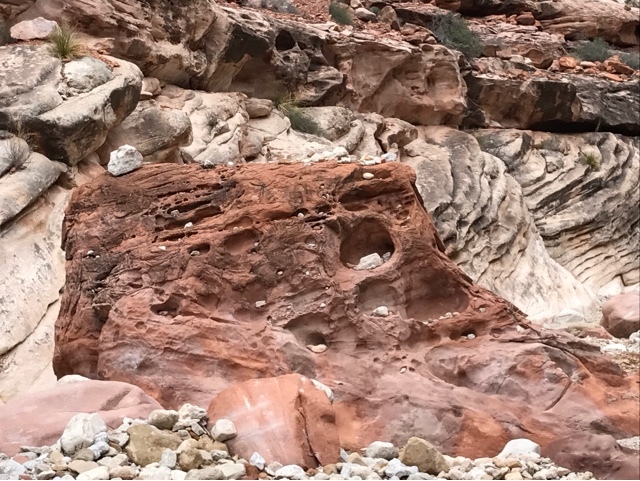 The dry riverbed has under cut the stonewalls of the canyon in spots. 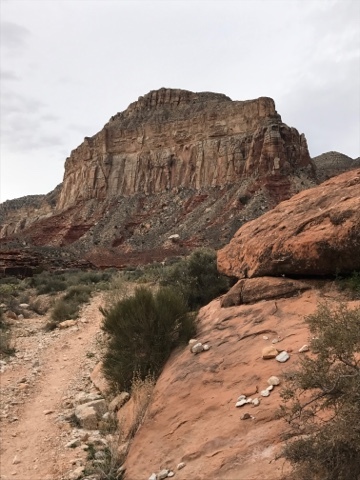 You need to be ready to hike on loose sand and gravel for your whole hike. Further down the canyon the canyonwalls become closer and there is less sun. 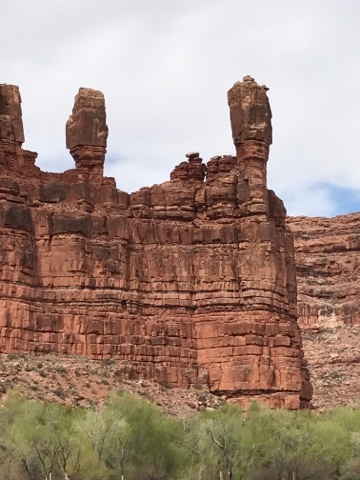 You eventually see some interesting rock formations. We met a solo horseback rider who was checking the names and how many people were hiking in. He wrote all the information down but we did not know what they do with the information other than possibly check to ensure you have a reservation. They do not take kindly to day hikes and showing up without a reservation. 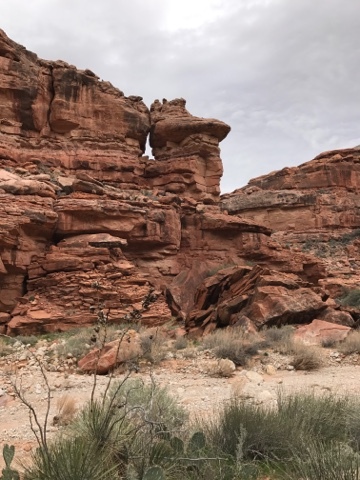 There are a couple rock formations in the middle of the riverbed that are harder rock and there are indents from washouts that people have put small rocks in the divots like a curio cabinet. 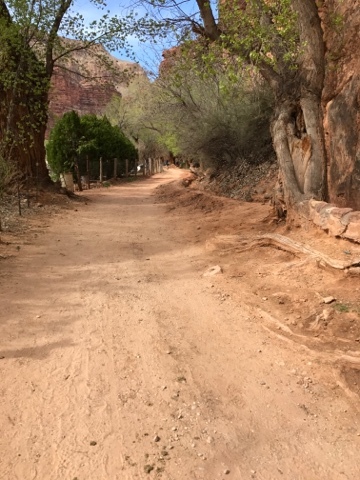 There are narrow spots like this one where you need to listening for mules and horses coming at you around the corner. 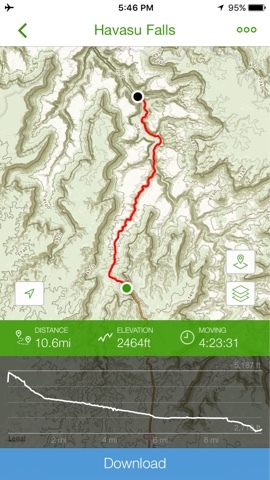 This happened a couple times each way in the canyon. About 5 miles in there was some running water in the riverbed that went back underground shortly after. 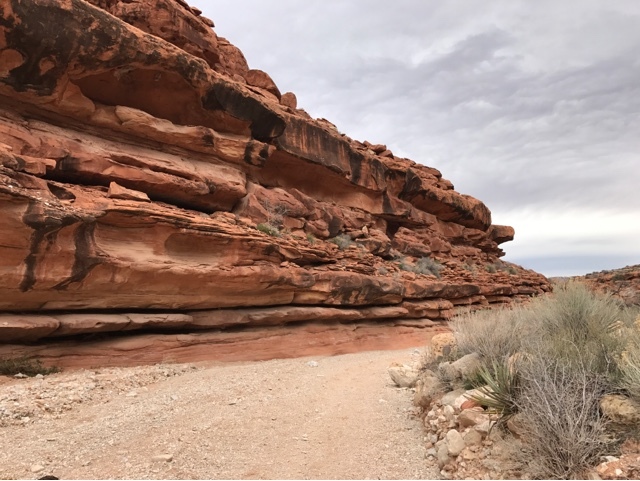 During the spring rain and especially the monsoon season of July and August you have to pay a lot of attention to the weather and plan accordingly. 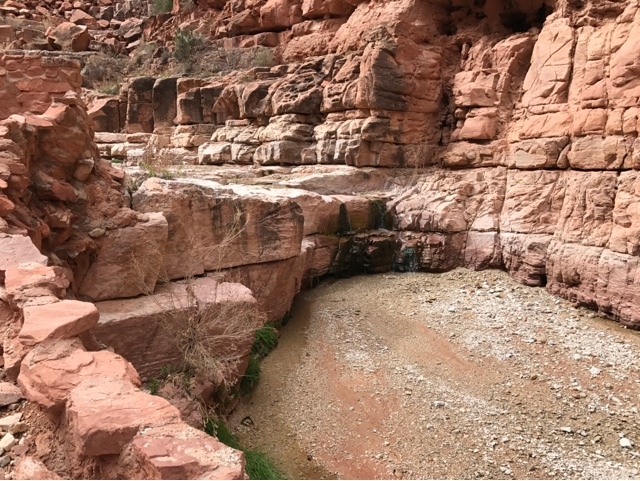 When the canyon widens you are nearly at the point where the trail turns left towards the Supai Village and you meet the Havasu Creek. This is the sign where you turn left and you have hiked just over 6 miles. 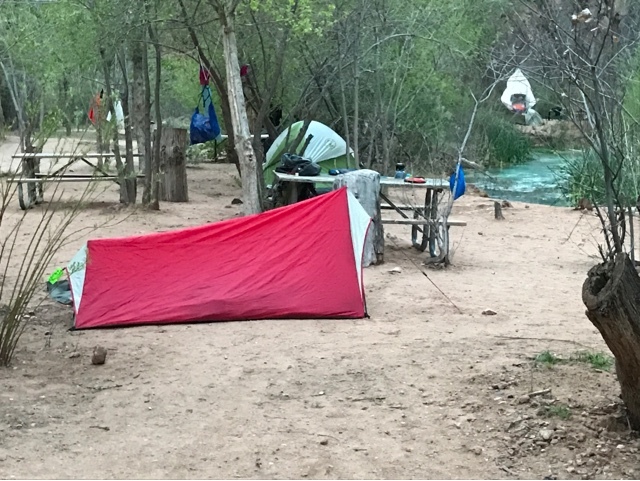 It's time to take a break next to the Havasu Creek and make some lunch. 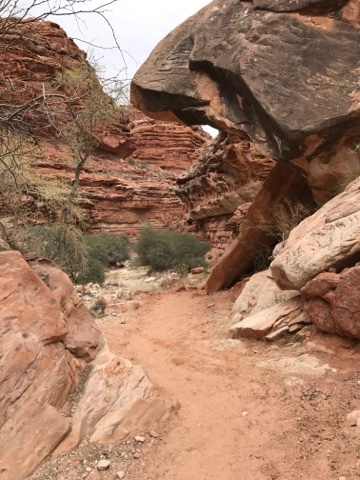 After you turned left you are in a tight canyon again. 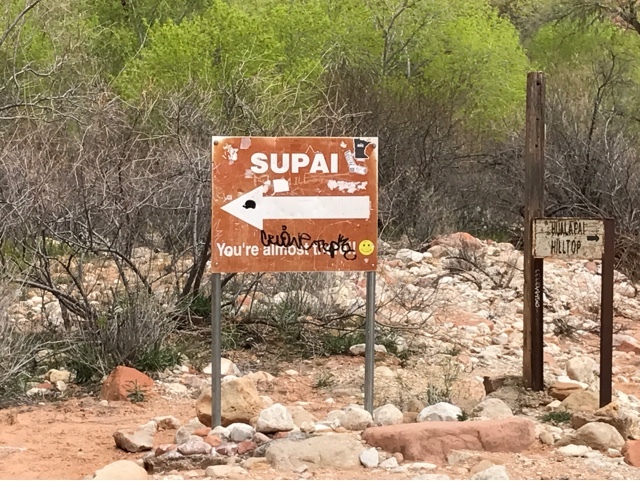 The canyon then opens again where multiple canyons meet and you have hiked 8 miles from the top and you are in Supai Village. The village is up ahead. 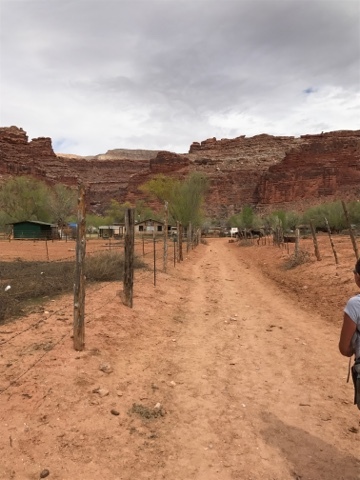 In respect for the Havasupai I did not take pictures of their dwellings and village people. I will cover the village in a separate post. In the village all campers must stop at the tourist office to be checked in. Joanne went in as it was her name on the reservation. We were given maps and wristbands, and a tag for my tent. Now through the village we still have a few more mikes to go. 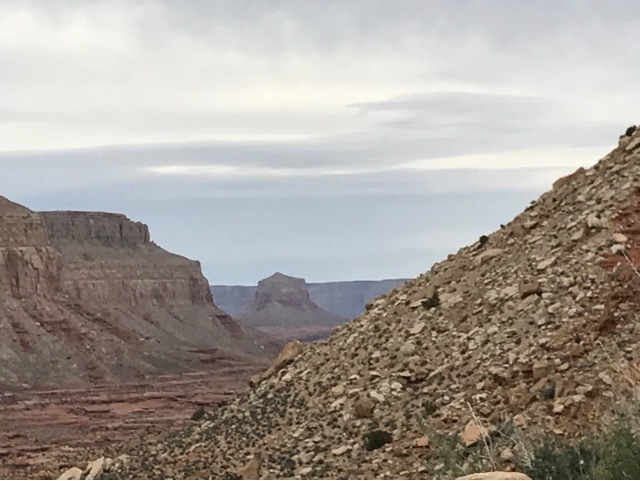 It is about 2.5 miles to our campsite and you descend another 500 feet. We made the campground and chose a site near the water but not too low to it. You get a picnic table, composting toilets, and spring water. I will cover these in more detail in another post. Here is my Walmart 1P tent and Joanne's bivy sac. 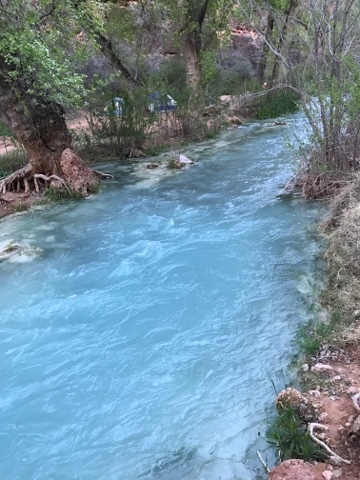 This is Havasu Creek as it passes by our tent. Yea. I still can't believe the color and the 72 deg temperature, even having been there now. 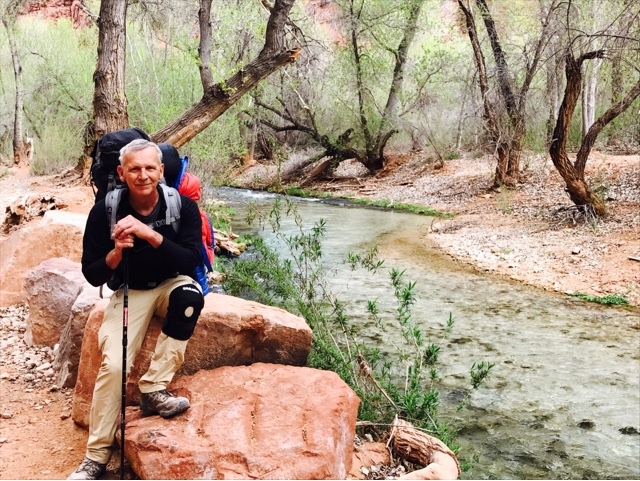 This is a hike that you need to be in shape to do in reverse. your tent looks a lot roomier than the bivy sack! Yes, I could keep my backpack inside with me. We had a brief couple of showers overnight and I had no worry. There isn't enough room to sit up and you need to crawl in the open end and that's a pain. I have a fixed vent in the foot end and I opened the head end leaving the screen and this kept moisture down. I'll be reviewing the equipment I took on the hike as time permits. did you camping partner say anything about her experience in the bivy compared to yours? Yes she did. 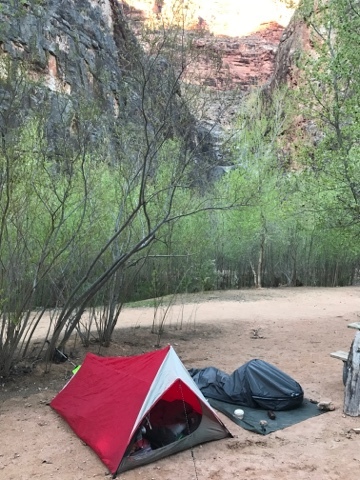 In addition to not being able to put her backpack inside, she did leave the rain over open opting for the screen and as she woke during the night she could watch the stars and clouds that delivered a couple showers during our first night. When the showers came she flipped the rain cover over her head until the shower passed. We didn't get enough rain to cause her to zip the cover closed. She seemed to be satisfied with the bivy overall. Thanks Brent, good to know someone's real life experience with a bivy.